CIS Excellence Awards principal sponsor, Caterer.com, have revealed the UK’s top 60 employers in hospitality. Hosted by TV personality Sue Perkins, the ceremony took place at London’s Lancaster Hotel on Monday night. Winners included YO! Sushi, The Rezidor Hotel Group and De Vere Venues, with independent bar company Urban Leisure Group (pictured) taking home the top prize of Britain’s No. 1 Best Employer in Hospitality 2014. Hundreds of employers entered the awards and almost 9,000 employees completed the survey, with 60 organisations gaining an engagement score high enough to allow them into the Top 60 Best Employers in Hospitality countdown. Each of these employers will receive a free engagement report from People Insight, detailing their results. 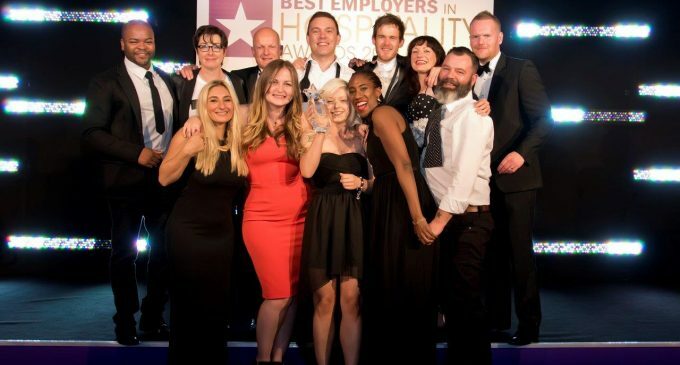 Now in their fourth year, Caterer.com’s Best Employers in Hospitality Awards are the only established free-to-enter employer awards in the hospitality industry. Judged solely on employee responses to an online engagement survey provided by engagement experts People Insight, the awards gauge how well employers support, develop and reward their people. Small Independent Food Service Provider Vacherin LTD.
Small Group Hotel Employer (under 100 employees) Summit Hotels Ltd.